This is better than being outside! Nothing strikes more fear into an owner’s heart than realizing they have lost one of their ferrets. Also having found a ferret is something many people are unprepared to handle. Below is information about how to go about dealing with a lost ferret. Following that is an article originally published by L. Vanessa Gruden – Executive Director of the Ferret Association of Connecticut with some tips to help deal with Finding a ferret. Start with checking your house thoroughly. Ferrets rarely make any noise and many times they may just be hidden away in a closest, under furniture or gotten into a basement or other unsecured area. Check those areas first. A squeaky toy, if your ferret is aroused by the sound can be very useful in getting a reaction – though it is not fool-proof. We have had ferrets sleep soundly through several hours of squeaking, calling and bell shaking. But eventually, if they are hungry, they will come out to eat if they can. If not, suspect they have gotten out or locked in someplace. The obvious first actions are to check with and alert neighbors. Posters with a recent photo are very effective. Plaster the neighborhood as people do not always read 1 on a street. More is better. You can read more tips at PawBoost. PawBoost also offers a free to use alert service. They alert area shelters, humane societies, animal control facilities, and vet offices. That alone is extremely valuable and we hope they can stay viable forever! They also offer the ability to promote your lost ferret via social media at an additional cost. We cannot attest to the value of the additional cost, but through PawBoost we posted a lost ferret and within hours were contacted by someone who had seen a post about a found ferret from that area. Fortunate, yes, but it also demonstrates the effectiveness of their alert system. You can also sign up to be one of their volunteers. The service is available for any type of lost animal. Catch it – A ferret left outdoors may wander off or be injured by a car or other animal, so catching it right away is important. No human has ever contracted rabies from a ferret, but if you are nervous about being bitten or the animal looks ill, use gloves to pick it up. Secure it – Use a large box with high sides or a secure pet taxi to contain the animal. Be sure there are air holes if you need to close the box top. Provide protection– Put the box in a warm, but not overly hot, place. 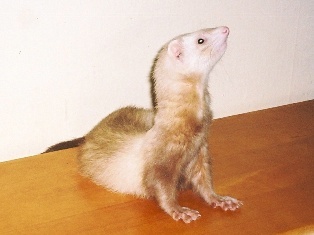 Ferrets cannot tolerate temperatures over 85 degrees. They should not be housed anyplace where it is lower than 55 degrees. Provide bedding – Put a small, old towel or t-shirt inside so the ferret has someplace to snuggle. Provide water & food – Ferrets outdoors may have been unable to find food or water, so both are vital. Use a heavy ceramic bowl for water, or it may get tipped over! You do not need to buy specific ferret food if you plan to house the animal temporarily; many ferrets will eat dry cat food and its fine on a short-term basis. Ferrets rarely overeat but if it is especially thin and looks starved, limit food to a small handful at first; starved animals need to begin eating again slowly. Could There be an Owner? Look for signs or posters for a lost pet within a radius of several blocks up to ½ mile. Ferrets have been known to travel further, but it’s more usual for them to try to find a close, safe spot in a garage, patio, or barn. Call your town animal control officer to see if anyone reported a lost ferret. Also call any pet stores or veterinary hospitals in town as well as nearby animal shelters, where owners might post lost notices. Look for lost advertisements in local papers or on Craigslist.org. If you are able to keep the ferret for a few days you can post your own found ad. Newspapers let you do this for free. Make the ad vague so callers have to clearly describe the animal and the area where it was lost. Sadly, people exist who will try to claim a pet that isn’t theirs. You can ask your animal control officer if they accept found ferrets, but many do not have the facilities to do so. Some humane groups or veterinarians will also take in ferret foundlings. FACT does our best to keep space available for animals that are found outside because we recognize they have so few other options. If outside our local area, search for a nearly shelter at the Ferret Shelters Directory. Call us first. We will strive to make an appointment as soon as possible. If you can drive the ferret to Hartford we appreciate it! If not, we will try to arrange transport through our volunteer network, but it may take several days. We will have you sign an impound form. Under Connecticut state law, pets found outside are subject to certain regulations. For instance, the finder can charge a reasonable boarding fee and the owner must reimburse the finder for any veterinary costs incurred if the animal is sick. By signing the form, you are transferring those rights to FACT. Keep looking for an owner! Someone may not have had time to immediately post their lost pet. YOU have done a terrific thing by taking in and helping an animal in need. Your kindness will keep a small ferret from starving, being injured or killed by a dog, wild animal or vehicle. Thank you for being a caring animal lover!